This third volume of the Wireless Public Safety Networks series explores new tendencies in the Public Safety Networks (PSNs) field, highlighting real-use cases and applications that can be used by practitioners to help victims in the case of danger. 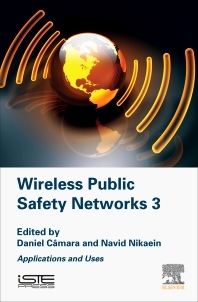 Wireless Public Safety Networks 3: Applications and Uses explores, from the communication point of view, how teams can interact with and use new technologies and tools. These technologies can have a huge impact in the field of disaster management and greatly improve the efficiency of teams handling emergency situations. This volume of the series covers themes as varied as emergency alert systems, the organization of aerial platforms and the use of smartphones to detect earthquakes and to help in the resolution of kidnappings. Navid Nikaein is Assistant Professor in the mobile communication department at Eurecom in France, where he leads a research group focusing on experimental system research related to wireless systems with concrete use-cases found in broadband access, massive IoT, and public safety networks.